Blurb: The Blessed Galaxy has no other name. 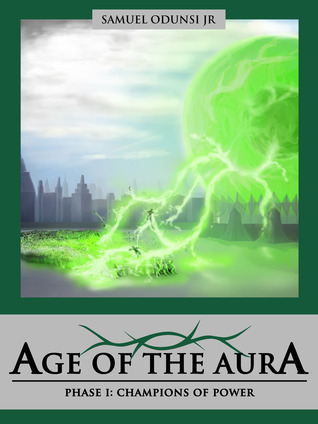 After being gifted with the Auras—five great powerhouses of celestial creation—the title was a suitable fit. For millennia, the governing bodies have ruled their respective reaches of the Galaxy while harnessing the might of the Auras. But now they face the threat of a calamity, from an unlikely source, that could shake the lives of all. Review: Champions of Power is not the type of book I would usually pick up- as much as I’d like to say that I’m a Sci-Fi fan, I’m not very widely read in the genre. This being said, I really quite enjoyed the book, especially as something different to the books I’ve read recently. The book starts with action, while it’s also quite vague about some of the things that are happening and why they are happening, which creates a sense of mystery which draws you into the story. The world itself is exceptionally detailed, which I found was really great in the sense that it created a clear picture of the world which the characters live in. The writing was constructed very well- at sometimes it was a bit formal or distant from the characters, but I believe that this actually adds to the complexity of the novel. I only wish that this book was a little longer- I loved how the book started and ended but I thought there were parts in the middle that could have been fleshed out a little more. However, I believe that this was a wonderful start to a new series that I’m sure will be enjoyed by many readers, myself included. Thank you to Samuel for sending us a copy of this book to review!